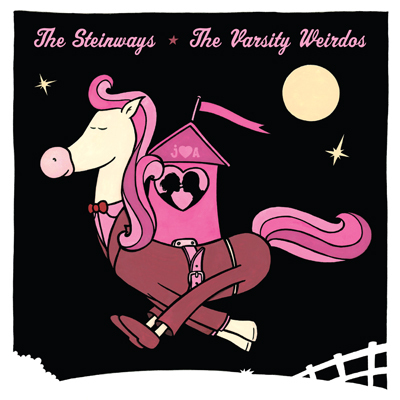 The Steinways / The Varsity Weirdos "Split"
Records to commemorate weddings have long been a tradition with underground record labels. It goes without saying that when Jenna and I got married there was sure to be such a record! I wanted this record to be a surprise not only for Jenna, but everyone else who attended the wedding as well. This record was made by friends for friends - I put the request out to three of our bands that we've been good friends with for many years that I knew had the easiest means to get recordings done, fast! Two of the three were able to write and record songs in less than 3 weeks! The Steinways and The Varsity Weirdos weren't given any specific direction for what their songs were to be about other than "Jenna and Adam are getting married." The songs they came up with were fantastic - some of the best material to date by both bands! When it came to artwork I knew there was only one person out there for the job, our longtime friend Stefan "Stardumb" Tijs. Again, no specific direction was given, and what he created was just perfect! This record was never sold by It's Alive Records. 50 copies were given to each band to distribute however they wanted to. The remaining 50 copies were given to friends we have come to know through the record label and the little underground pop punk circle and to supporters of the label who have been ordering records from us since the beginning.